The Ontario premier says he'll slice down Toronto's municipal government and cancel some elections. 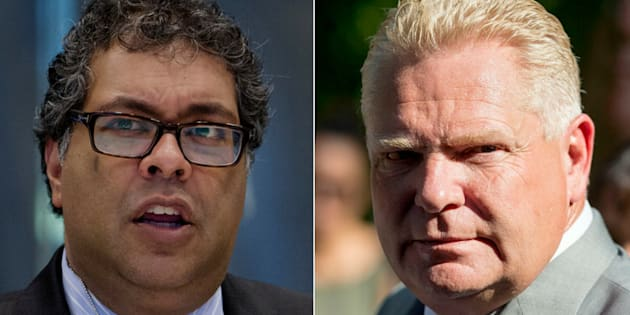 Calgary Mayor Naheed Nenshi says Ontario Premier Doug Ford's plan to cut down the number of city councillors in Toronto is not fair. Ford said Friday his Progressive Conservative government will introduce legislation to cut the number of seats to 25 from 47 and cancel planned elections for regional chair positions in several Greater Toronto Area communities. Ford's announcement came the day nominations for those seats were to close. "For you to say to those folks who put their lives on hold only because they want to do public service, 'By the way, the job you're running for doesn't exist any more' — that's unconscionable,'' Nenshi said. Nenshi also pointed out that one of the cancelled elections was being contested by Patrick Brown, whose resignation as Ontario Progressive Conservative leader opened the door for Ford's successful bid. Nenshi urged Toronto Mayor John Tory to fight the proposed legislation, because it could ultimately affect all Canadian mayors. "I would strongly suggest and support Mayor Tory in saying we've got to find a legal answer to what the limits of provincial authority are here.